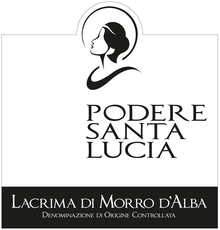 The Producer - Podere Santa Lucia is a new winery, founded in 2005 by Alfonso Balducci and Pietro Cacciani. The Caccianis are an old winemaking family from this region of Italy, the Marche, but for reasons I don’t know, they ceased operation until the two sons re-booted it in 2005. Their guiding motivation was to re-discover the traditional techniques of winemaking used for millennia in their home region, including this unique grape – Lacrima. The region’s ideal climate, excellent sun exposure and soil type makes “Santa Lucia in Monte San Vito” one of the ideal growing areas, and specifically the “Lacrima di Morro d’Alba” DOC. BTW, the winery’s logo was inspired by The Santa Lucia Altarpiece, one of the most important works of art in this area. The Wine – There are differing accounts about how this grape got its name – some say it’s because the grape clusters are tear-shaped (Lacrima being the Italian word for tears). Others say it’s due to the grape skin’s tendency to rupture when over-ripe, allowing the grape’s juice to leak out, dripping off the grape like a tear. One imagines an entire vineyard of Lacrima vines shedding tears on the ground as the grapes near optimal ripeness. This is one of the most unique wines I’ve tasted from Northern Italy (Alba is close to Asti and Turin, in the upper left portion of Italy’s “Boot”). It has a very deep purple color, with dark berry aromas and this distinctive and persistent nuance of rose petals, and surprisingly aggressive tannins for a wine of such feminine aromas. I enjoy the uniqueness of this wine, but it takes some getting used to. Pair it with a rich pasta sauce. And pasta too, of course. Lasagna would be perfect.